Surf rock has always been a favorite of mine. It was a short-lived phenomenon of the early 1960s, made mainstream by the nation's obsession with California, the electric guitar, and surfing (the latter's popularity partially due to the influence of Gidget). But except for a brief revival in the post-Pulp Fiction era, the movement has pretty much languished as a mostly-forgotten subgenre. Nowadays, California is bankrupt, the electric guitar is nothing new, and surfing doesn't represent the great youth countercultural movement that it once did. The Beach Boys are the exception, the group that began as a novelty surf act and somehow became an indispensable part of the American musical landscape. Something about the Beach Boys' sound transcends early 1960s southern California - there's something quintessentially American about their songs. And while I don't think surf rock will ever get the respect it deserves, but I'm glad the Beach Boys, at least, have penetrated our cultural consciousness. Their music is largely naive and carefree, which means that they provide the perfect escape from our mundane daily obligations. Hell, I've never been surfing in my life, but the minute I put on the Beach Boys, I find it hard to not feel like I'm surfing in southern California in the sixties, bathing in warm sunshine and cool ocean water. Music has the strange power to transport you to another time and place - even a time and place you've never been to. 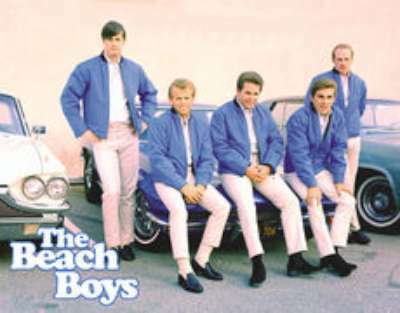 WHAT I KNEW BEFORE: To say that I was raised on The Beach Boys would be a bit of an overstatement, but not much of one. Every year, my mom would haul out her copy of Endless Summer and put it on repeat while cleaning the house, so I grew up pretty familiar with the Beach Boys' greatest hits. Still, I had always equated the Beach Boys with other novelty beach acts like Jimmy Buffett ("Cheeseburger in Paradise" being another family favorite), and so I was surprised to start reading "Best Of" lists and learn that the Beach Boys had been accorded a large amount of critical acclaim. That's what prompted me to take another look at the group. MY LISTENING: I listened to Pet Sounds (1966) every day this week. I also listened to Summer Days (And Summer Nights) (1965) and Surf's Up (1971) twice, and Shut Down Volume 2 (1964) and The Beach Boys Today! (1965) once each. WHAT I LIKED: Pet Sounds is consistently listed by critics as the best of the Beach Boys' albums, the pinnacle of their output. I was surprised, namely because I was unfamiliar with any of the tracks on this album besides the perennial "God Only Knows". Listening to it, at first I was a little taken aback by the lack of songs about surfing and picking up babes at the beach. But really, that's what makes the album so great. Songs like "I Know There's An Answer" and "I Just Wasn't Made For These Times" go beyond the standard "sing about surfing" model to pack a real emotional weight, even while employing the Beach Boys' old bag of tricks - impeccable harmonization and precise orchestration. Brian Wilson can write a catchy song, but he also famously obsessed over every little noise on Pet Sounds. His micro-managing paid off - every beat of the drum, every bit of harmonized vocals, every woodblock and glockenspiel, all these intricately crafted timbres and sound effects culminate in a perfectly blended symphonic pop track, and even the instrumental filler tracks like the eponymous "Pet Sounds" are worth a listen. On many of the songs, the lyrics of youthful angst and unrequited teenage love belie the upbeat mood, and the juxtaposition of peppy, cheerful pop tracks with the often morose lyrics is interesting. At the same time, many of the songs are almost dreamlike, from the catchy harpsichord riff on the innocent "Wouldn't It Be Nice" to the ethereal fading away of "Caroline, No". The mood fits the theme of youth perfectly; the sweet, innocent harmonies feel like they could give way to the perils and pitfalls of adulthood at any moment. The Beach Boys' earlier hits are also in this vein - classics like "I Get Around" and "Fun Fun Fun" play up the naive innocence of youth, when all one has to worry about is cruising around the beaches in the summer and picking up girls. It describes a time that may or may not have existed in America, but is captured perfectly nonetheless. WHAT I DIDN'T LIKE: While the Beach Boys have a lot of great hits from the early 1960s, all you really need is a "Greatest Hits" album, which might explain my mother's Endless Summer possession. Because they were cranking out albums at a ridiculous rate of one to two a year, the records of this time contain quite a bit of unjustifiable filler. True, "In My Room" adeptly describes what it's like to be a teenager, but songs like "In the Parkin' Lot" are less successful, and some, like "Amusement Parks, U.S.A." are kitsch, pure and simple. Finally, there are those songs like "I'm Bugged At My Old Man" that I'm pretty sure are meant to be a joke, but that doesn't mean they're any more enjoyable to listen to. Avoid the dated filler, and stick to the greatest hits of the Beach Boys' early career. I mean, even as a kid, I knew that "Be True to Your School" sucked. As to the post-Pet Sounds era, marked by Brian Wilson's growing mental instability, I only listened to 1971's Surf's Up. Here, the Beach Boys are more psychedelic, and their songs carry an environmentalist message. It's not bad, necessarily, but I feel like the group's talents are wasted on songs like "Don't Go Near the Water" and "A Day in the Life of a Tree" that don't take full advantage of the group's vocal talents or Wilson's songwriting ability. After "Good Vibrations", the group definitely lost something, and no environmental concept album could bring it back. FURTHER EXPLORATION WOULD ENTAIL: There are many, many Beach Boys albums I haven't explored, from their 1962 debut Surfin' Safari to 1989's Still Cruisin', which spawned "Kokomo". But the album I'm most interesting in checking out is not a Beach Boys album at all, but rather Brian Wilson's 2004 solo release SMiLE. SMiLE is the final vision of a 1967 album that was abandoned due to Wilson's mental collapse. SMiLE has gotten very good reviews, and it will be interesting to see if it merits its 37-year delay. BEST SONG YOU'VE HEARD: "God Only Knows"
More than simply the best Beach Boys song, it might be one of the best songs of all time. BEST SONG YOU HAVEN'T HEARD: "I Know There's An Answer"